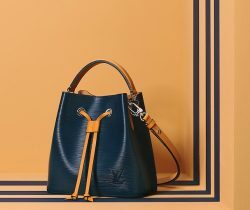 Updated as of March 2019 Introducing the Louis Vuitton Spring/Summer 2019 Bag Collection. Louis Vuitton presents new styles this season, that were first..
Louis Vuitton is set to open a pop-up store in New York City for Virgil Abloh’s Spring/Summer 2019 debut collection. For one week.. Updated as of January 2019 As we await for the full release of Virgil Abloh’s debut collection for Louis Vuitton, here’s a sneak..
Louis Vuitton recently held a press preview for their Spring/Summer 2019 Collection after their futuristic runway show. Guests got a closer look at..
Paris Fashion Week has finally come to an end. Ending the event is Louis Vuitton with a futuristic themed collection. Nicolas Ghesquière presented..
After the success of the recent runway show of Virgil Abloh’s debut collection for Louis Vuitton, a special preview were held at Louis.. Introducing the Louis Vuitton Men’s Spring/Summer 2019 Runway Bag Collection. The much anticipated debut collection of new Artistic Director Virgil Abloh has finally..